Blythe Meet - Lost in Space! Cassady, Paige and I attended a fun Blythe Meet today - our first of the year! It was quite a large turnout as we had nearly 30 people in attendance. I think it's the biggest turnout in all my years of going to Blythe meets! The theme was "Space," and so many girls dressed up for the occasion. We had lunch at Curry House, walked across to Q-Pop, took photos in front of the space shuttle sculpture, and hung out in front of Starbucks. 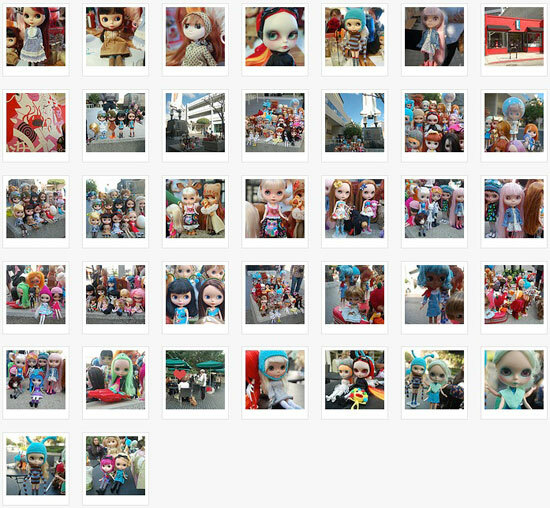 Of course, being in the middle of Little Tokyo, a lot of passers-by were curious at seeing a bunch of crazy dolly people taking pictures of our dolls, and they stopped to take pictures as well. I realized that since I got into Blythe in 2003 and started going to meets, this was my *26th* meet. Crazy! I counted every one I've been to (including mini-meets in people's homes, etc). I never realized I went to so many! I still really enjoy going to Blythe meets. After a meet, I get really inspired to craft - especially after seeing other people's amazing customs and sewing/knitting/crocheting, and of course, it ignites all sorts of dolly lust. Last time I was in love with Tart & Tea, and now I really want a Matryoshka Maiden. Cassady, Paige, Una and I had a wonderful time hanging out with everyone at the meet - hope we'll get to do it again soon!